We sold our house yesterday and left Florida. Sleeping on an air mattress on the floor in a house that sounds hollow with three dogs is not highly recommended. Nor does it make for a stress-free day to start a long drive. But we managed to leave with our relationship still intact and our cars packed very tightly. Day one we travelled to Florence, SC. When the parking area of your hotel is full of Harleys and a huge truck with very loud “boom boom” music, you should know that there will be a problem for two people who are road weary and just want a shower and a sleep before travel tomorrow. Three phone calls later, the front desk got us moved away from the man with the very loud radio and his friends. Once we unplugged the refrigerator that sounded like fire alarms were going off outside, we hit the sack at 1:00am, the bikers came back to roost with engines revving. I’m sure all of this will be funny when we have arrived home but it wasn’t funny knowing our longest travel day is today. So, at 5-something this morning when Ned woke up, it was a bit early. But we will get an early start and arrive early. Hopefully, the next hotel will be quieter or it’s going to get ugly. I get less and less functional without sleep. Monday our internet will be connected at the guest house and the electrician will be coming to separate the guest house electric from the big house panel. Our dream begins. 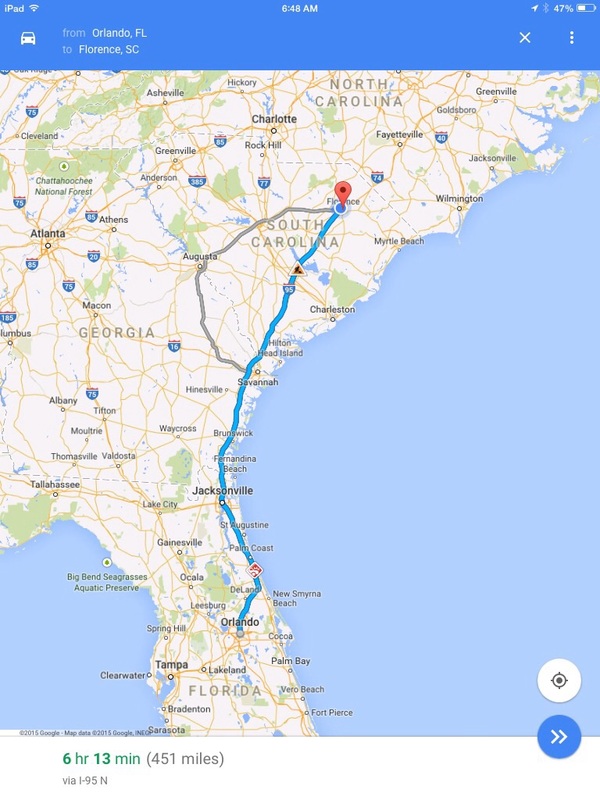 This entry was posted in Before the Move and tagged adventure, before the move, bikers, Florida, Harley, LaQuinta, Maine, moving, moving to Maine on April 25, 2015 by lindarockwell3.